Firearms and Training: Lancer lightweight carbon-fiber handguard for an extra light build. Lancer lightweight carbon-fiber handguard for an extra light build. 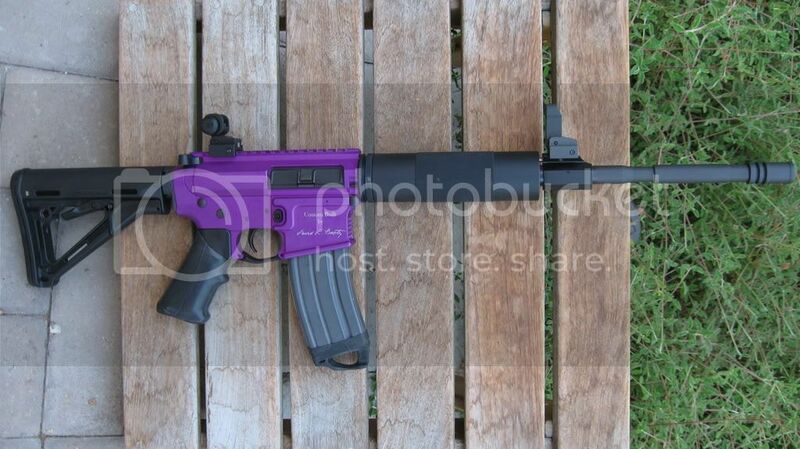 I think I'm going to lighten up my Wife's purple Sun Devil build and I've found the perfect handguard to to the job. Found at Lancer Systems SHOT Show booth, the new carbon-fiber handguards that can accept accessory rail hardware too if you get it with the cooling slots. I'll change out the current heavy solid aluminum handguard with the sleek carbine length carbon-fiber handguard which weighs in at 6.8 oz. The old handguard and receiver extension weighs in at over a pound. I should cut a whole 16 oz of weight off of the rifle which would make it very light indeed! Only thing is I have to wait till June 1 until they release the new product! Interesting look, thank God they're free-floating. Some people like a little muzzle-forward weight?